I have long admired the painting above. It is one of the most iconic paintings of the twentieth century and has been inspiring painters and photographers since it was first seen in 1942. Last night we were at a Beginners and Improvers class with our local camera club – The Beacon Camera Club – and the talk was about improving your images. Nick Browne who gave the tutorial began by showcasing a number of photographs and paintings that inspired him and I was gratified to see this on the list of twenty that he showed us. It prompted me to take a closer look in this blog. The painting above is one of my favourite paintings of all time. Even if you haven’t seen the original (as I haven’t), you’ve probably seen it referenced in articles, or mimicked in other art forms. Looking on YouYube, I came across this amusing and provoking reminder of this iconic image. “I was painting the loneliness of a large city.” Hopper’s words are as lean and precise as his painting. The painting and those nine words are all you need to love this image and appreciate its emotional power. I guess all of us keen photographers have walked around with our Hopper hat on trying to pay homage to the master and produce our own piece as an homage to Hopper, or to ape his techniques to try and imbue our images with an emotional connection – to create our very own Hopper artscape. In my case, I have had Hopper in my mind on the last two night shoots I did and I will share them here, not to compare myself to Hopper, that would be dumber than even I can be, but to reinforce the brilliance of Hopper, by exposing the shortcomings of my images. This image was taken at Halloween in Worcester. 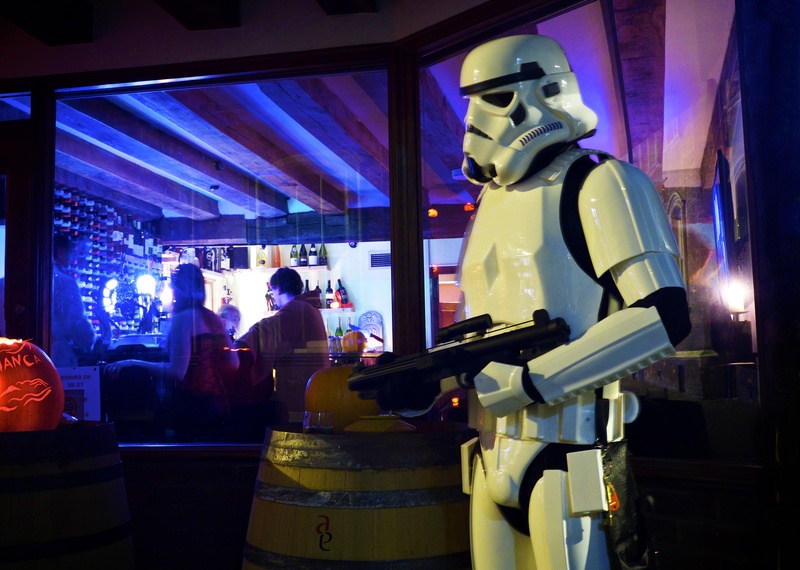 I liked the image, the strong colours, the intimacy in the bar is reinforced by the tight framing of the window and perhaps the Star Wars Trooper implies a darker more dangerous quality outside on the streets. Not “the loneliness of the big city” then, but a justaposition of safety and danger, more a “safe haven in a dangerous world” I am implying then that the picture works on an emotional level. But does it really? Hopper’s does, it’s instant, you don’t really need Hopper’s words, “the loneliness of the big city” to instantly connect with his painting, its just there. With this though, do we really see a safe haven in a dangerous world.? It’s just a guy dressing up for Halloween (well, I think it’s just for halloween!) can we really read danger in that or is the emotion as plastic as his uniform? In this second image, I definitely had Hopper in mind but in truth “the loneliness of the big city” is very hard to reproduce in Great Malvern. The first point is that it isn’t a big city, so there were no lonely people to populate the empty café, so I went for a different take and went for a “life style shot” the chic car parked in front of the cool and happening restaurant. Even from this perspective, it falls short, as for that message to work a busy café is needed, so the image isn’t “life style”, or “urban chic” and it isn’t “the loneliness of the big city.” So yes I am trying to ape Hopper, but ultimately it isn’t Hopperesque but its failure is not from any technical oversight but from the failure to draw any real emotional response. 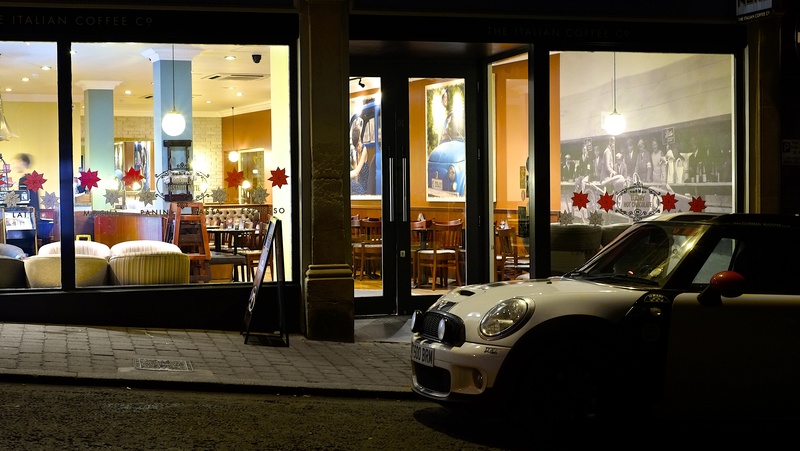 If it was a lifestyle shot for MINI then the emotion would be ” I want a MINI” or to work on an emotional level, you might be drawn into the café and want to spend time there, or to work on a Hopper level, then a stronger emotion would need to emanate from the picture – loneliness, fear perhaps. Personally I like the image, but if I am honest then probably for no better reason than the MINI is mine, but in reality the emotional element that I believe is integral to the success of any image is just not manifest in this image. So think like Hopper and shoot like Hopper – be inspired and if your efforts, like mine fall short, don’t worry just have some fun. Categories: Photo Blog, Photo Styles, Sources of Inspiration, Street / Candid | Tags: Edward Hopper, Hopper, inspiration, Nighthawks | Permalink. Very interesting post. Edward Hopper is one of my all time favourites. 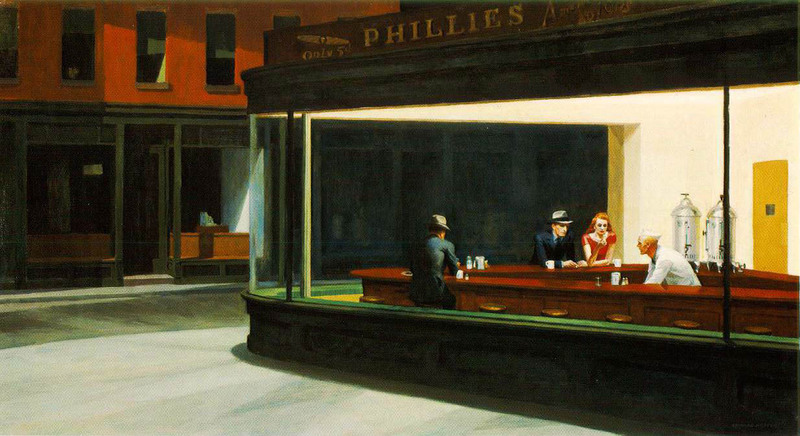 And not only for “Nighthawks”. I think he was absolutely right when talking about loneliness in a large city” even though he also visualized loneliness in the countryside. In all of his pictures I can see loneliness, speechlessness, disaffection where even couples and friends act like strangers. Thank you for stopping by and making time to comment. An old inspiration, but one I was reminded of recently at a camera club meet, and I really felt I had to say a few words about it.